L-Shaped Planters 2'x6'x6'x24" and 1.5'x4.5'x4.5'x13"
Planter boxes can be set up on any flat surface. L-shaped planters are ideal for container gardening in corner spaces on your deck or patio, balcony or rooftop. They work well in combination with square and rectangle planters and garden trellises to enclose an area with flowering vines, fragrant herbs and vegetables. Planter boxes are easy to assemble and very durable, made from the same rot-resistant cedar and non-toxic finish as our popular raised beds. With our flexible kit system, you can build a garden in almost any shape or size, including custom planter designs. If you're looking for something in particular, give us a call or let us know your specific needs for tips and advice on building a container garden. Easy assembly—stack boards and insert corner pins. Attach trim pack and bottom with included screws. Build planter boxes in endless shapes and sizes. Width - Planter boxes 1.5 to 2 feet wide provide space to grow vegetables in a small footprint. Narrow planters work well along a railing or fence, and as garden privacy screens, with matching trellises. Wide planters provide space to accommodate larger plants, even small trees, if you have the room. If you're limited on space, choose a narrow planter and build up to increase soil capacity. Length - Planter boxes can be any length to run along a fence or enclose a deck or patio. Short planters can be used as corner accents, or flower boxes around benches and porches. Planters up to 6 feet long are available above, let us know if you need something longer. Height - Planter boxes come in six heights, from 7.5 to 35 inches. Tall planters provide soil space for deep rooted vegetables, flowering vines and perennial shrubs. Short planters are useful for growing salad greens and short season herbs and flowers. Consider your garden's root depth requirements when choosing the height of your planters. All of our planter boxes are made from durable cedar protected by a non-toxic waterproof sealant that is safe for vegetable gardening. Planter boxes are available in many shapes and sizes, including custom-sized planters. If you don’t see what you’re looking for, just ask. We’ll help you build the perfect garden! Planter boxes can be set up on any ground surface that is reasonably flat and level, such as a deck or patio, rooftop, driveway or parking lot. The planter’s slatted cedar bottom lifts soil an inch off the ground and provides excellent drainage on non-absorbent surfaces such as concrete. 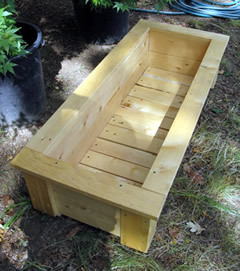 For gardens on dirt and lawn, take a look at our raised garden beds. Follow these simple instructions to assemble your planter. It’s recommended to add 1-2 inches of gravel to the bottom of the planter before filling it with soil. This will help prevent soil from washing out over time, and improve drainage and aeration for healthy soil conditions. You can find more tips on building a container garden in our gardening help section, or let us know your specific needs for free garden planning and advice. If you have any questions, please send us an email or call 1-800-807-3404 to speak with a friendly gardening advisor. 10 year warranty Planter boxes are covered by a 10 year limited warranty.